SPX futures are trading in a narrow range around yesterday’s closing value. The FOMC concludes its meeting today and only leaves a policy statement for its trouble. It is possible that the policy statement may be used to shape expectations about the course of future rate hikes. 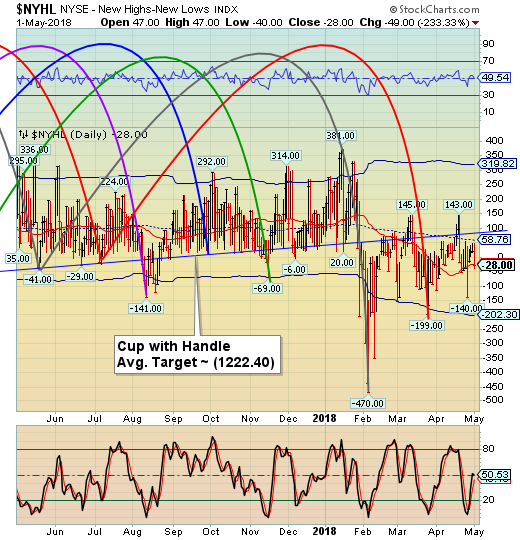 Be prepared for more upside as the Cycles Model suggests a “bump” higher before turning down. 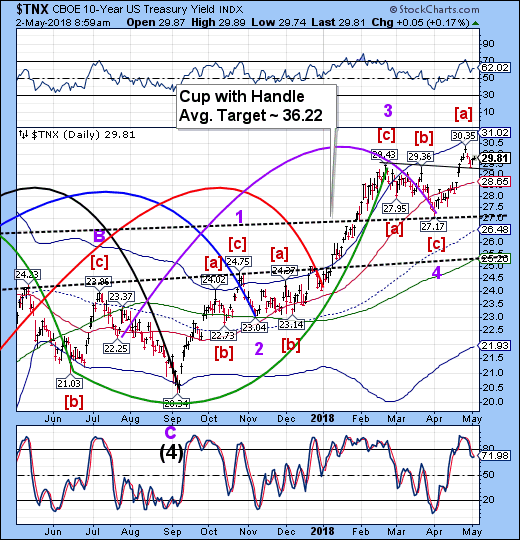 Short-term resistance at 2664.73 may be the target for today’s action, but a run at the 50-day Moving Average at 2688.85 isn’t out of the question. 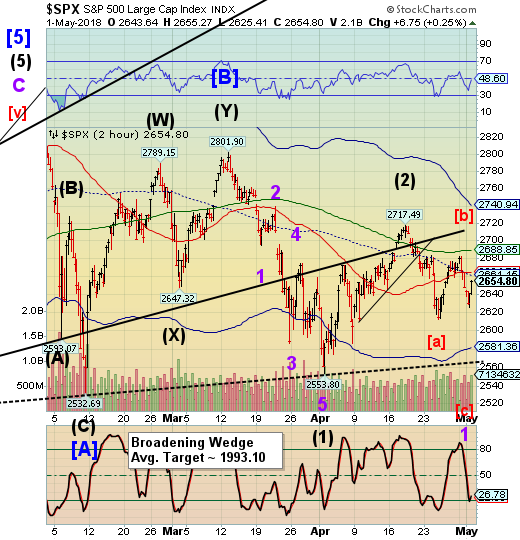 The simple 200-day Moving Average at 2573.77 is key in maintaining the long-term trend. Mike Shedlock’s article on TheMaven gives us some insight into the dynamics of this observation. NDX futures are a bit more positive than SPX. 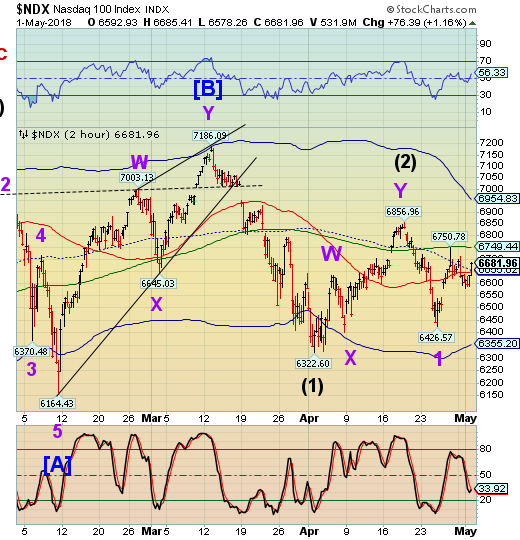 It appears more likely that the NDX may challenge its 50-day Moving Average at 6749.44. ZeroHedge reports, “Critics of President Trump's tax reform plan said corporations would just use the massive piles of cash repatriated under the new tax law to buy back more stock. And, as it turns out, Apple has proven them right. VIX futures held near the flat line this morning. 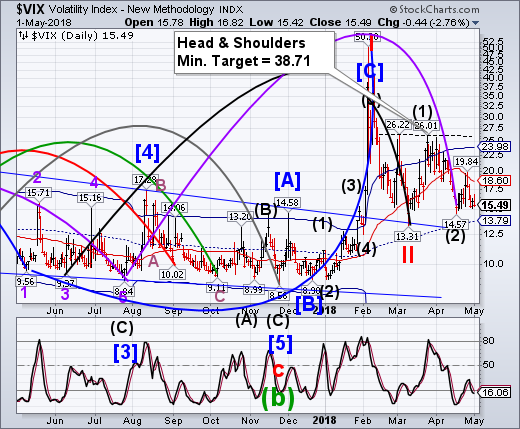 Considering the FOMC meeting today and its consequent statement, it would not be out of the ordinary to see VIX revisit its April 17 low. TNX is also flat-lined this morning. Bloomberg reports, “The U.S. Treasury Department will boost the amount of long-term debt it sells to $73 billion this quarter as President Donald Trump’s administration seeks to finance budget deficits set to widen further because of tax cuts and higher spending. The NYSE Hi-Lo Index closed beneath its 50-day Moving Average at -24.37 yesterday. This tells us that there is an erosion in the participation in the rallies, despite the afternoon save in the SPX yesterday. It is possible that a good share of yesterday’s rally may have been from a judicious buyback from Apple.